NEW YORK — A century after the Titanic sank, the legacy of the ship's wealthiest and most famous passenger lives on quietly at the luxury hotel he built in New York City. John Jacob Astor IV, who was one of the richest men in America, went down with the ship in 1912 after helping his pregnant wife escape into the last lifeboat. But at the St. Regis, one of Manhattan's oldest luxury hotels, the aristocratic sensibilities of the Gilded Age remain intact. Butlers in white ties and black tailcoats still roam the hallways. The lobby, with its frescoed ceiling and elaborate marble staircase, has not been altered since Astor died. And the thousands of leather-bound books that he collected have been preserved on the same bookshelves for 100 years. This year, in tribute to Astor's memory, the hotel worked with a publisher to add a new book to those shelves. "A Survivor's Tale," which was released this month, is the first-person account of a passenger who survived the disaster by jumping overboard as the ship disappeared into the water. 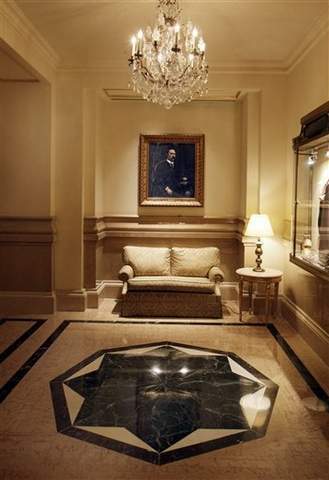 "This was his jewel," said Astor's granddaughter, Jackie Drexel, as she gazed around the hotel one recent morning. "My grandfather used to come and walk the stairs frequently first thing in the morning to make sure everything was running perfectly. He conceived of it with great pride." The copper moldings on the roof have turned green with age, but inside, the antique furniture and silk wall coverings hearken back to a more refined era. And the guests wandering its hallways are still the wealthiest of the wealthy: the hotel is a favorite among royal families and celebrities hoping to keep a low-profile and avoid the paparazzi. "The key element to everything in the hotel is the discretion," said Paul Nash, the general manager. "We have heads of state, royal families, entertainers, politicians." When Astor built the St. Regis in 1904, it overlooked Fifth Avenue's row of mansions and, at just 18 stories high, was the tallest skyscraper in the city. It was modeled after the extravagant hotels of Europe that had not yet become ubiquitous in the U.S.
At that time, it was common for the very rich to live in luxurious hotels like the St. Regis for long stretches of time. According to Nash, that hasn't changed, either: The hotel's presidential suite, which costs a cool $21,000 per night, is routinely occupied by the same guests for three months straight. "They can walk around the hotel like it's their home, and nobody will disturb them," explained 25-year-old Jennifer Giacche, one of the hotel's butlers. While the uniform looks like it was plucked from the set of a period drama, the St. Regis butlers' job responsibilities have evolved over the years to meet the needs of 21st-century jetsetters. They still pour coffee and fluff pillows, but the butlers of today — a rarity at modern hotels — are really more like highly educated personal assistants who speak several languages, not the stuffy servants portrayed on TV's "Downton Abbey." "Our guests may travel by private jet, but they're also probably wearing blue jeans and a white T-shirt," Nash said. Using "e-butler," the hotel's personalized smartphone app, guests can start issuing instructions to their butler before they even check in, whether it's ordering a limousine or a bottle of champagne. Visitors preparing for an extended stay often want the furniture in their rooms completely rearranged. One of the most memorable requests came from a guest who wanted her bathtub filled with chlorinated pool water (which the butlers obliged without asking why). Like his guests, Astor enjoyed a pampered existence as a member of one of New York's most powerful families. But he was also a keen inventor — creating an early form of air conditioning by blowing cold air over the hotel's wall vents — and an avid bibliophile. With the help of Thornwillow Press, a small publisher of limited-edition books, the hotel is in the process of restoring and cataloguing the nearly 3,000 books that Astor left behind. "If John Jacob Astor were to walk through the rooms, it would be entirely familiar to him," said Luke Ives Pontifel, Thornwillow's founder. "He would recognize the books on the shelves. It's a time capsule." On April 4, the St. Regis held a small dinner in the hotel library to commemorate the 100th anniversary of the Titanic's sinking. The guests, who included some of Astor's descendants, were dressed in fur and feathers as they perused his books and dined on food inspired by the last meal served aboard the ship. They also received copies of "A Survivor's Tale," which was written by Jack Thayer and is being published publicly for the first time with the permission of his family. Thayer, who was 17 years old then, recounted how his mother escaped in a lifeboat, but his father perished along with most of the men on board. Thayer survived by clinging to a lifeboat for hours in the freezing sea, listening to the wailing of the passengers who froze to death. "It sounded like locusts on a midsummer night, in the woods in Pennsylvania," he wrote. "I think he stayed to the very end, putting people in lifeboats," said Drexel, his granddaughter. "He never tried to escape himself." Drexel believes he would have been pleased with the way his legacy has been preserved at the St. Regis. If he had survived the sinking, she believes he would have built many more hotels in his lifetime. "It makes me proud to speak of him," she said. "I wish I'd known him. I wish my dad had known him. I think that's the saddest — that dad never had a chance to meet him."